Learn more about events in support of Huntington Society of Canada (HSC) across the country, as well as tips and tricks for your event! On August 8, Shelby Smith, her boyfriend Alex and their family hosted the Regina Steak Dinner and Silent Auction to raise funds for the Huntington Society of Canada (HSC). The event saw over 200 tickets purchased and close to $8,000 raised. The planning for the event all started when Alex registered for the second annual Regina Casino City Charity Championship, where participants are asked to raise money for charities of their choice. The goal was to raise as much money as you could prior to the race day to gain advantages by having seconds taken off your race time. The group came in 4th place at the challenge on August 19. We spoke with Shelby recently to get her thoughts on the championship, her connection with Huntington disease (HD) and the future of Regina events. Shelby & Alex's group came in fourth place in the Challenge on August 19. Photo courtesy of Casino Regina. What is your connection with HD? HD runs in my family coming from my mother's side, who is in the very late stages. Her brother (my uncle) has since passed from this disease and her sister (my aunt) chose to bravely take her own life while advocating for the dying with dignity cause. I have an older sister who has also unfortunately been diagnosed with It. Why did you decide to organize this event for HSC? The casino put on a charity championship and my boyfriend, Alex, and I thought it was a perfect opportunity to raise some money and gain some awareness! What did you learn most through the process of organizing this event? Through organizing this event I learned how little awareness surrounds HD. For something with no cure and that is this cruel and devastating to families we need to make sure people are educated and striving for a cure! Can you tell us a little bit about the Casino’s challenge? This was the second annual Regina Casino City Charity Championship! It is a 100 foot inflatable obstacle course relay style race. You put together a team of 4 people who individually run through the course and back to tag the next teammate! The goal was to raise as much money as you could prior to the race day to gain advantages by having seconds taken off your race time. It's an extremely fun event with a beer gardens and a BBQ for lots of different causes. It was so nice to see everyone out supporting charities that have impacted their lives. Do you have any future events to plan in mind? We are definitely planning on participating again next year! How would you like to see the Regina community getting involved going forward? I would really love to see any kind of awareness for HD in the city going forward as almost everyone I speak with has never heard of it before. I would also like to get the annual HD Walk to Cure back in the area. The walk stopped happening because of lack of participants, but hopefully with the awareness my family and Alex have created now, that will change! If you're interested in creating your own event like Alex and Shelby, contact us at events@huntingtonsociety.ca to start your planning! Visit www.huntingtonsociety.ca/events for fundraising activities in your area. Last month, Greg Shwaga walked 700km across the beautiful province of Saskatchewan, from Provost, Alberta to Roblin, Manitoba. It took him just under three weeks and his adventures were able to raise almost $30,000 for Huntington disease research and awareness. One of our team members was personally drawn to this fundraiser, as she spent five years living in Saskatchewan and this is something that she would love to do herself. She had the opportunity to talk to Greg and ask him some questions about his walk once he was finished. What was the most surprising part of the walk experience for you? The most surprising part was seeing how this event took off on social media. There were people that I hadn't met or hadn't seen in years that were checking in to see how I was doing. I live streamed the walk on Facebook and people actually tuned in to see me walking across the province. ​What was the most challenging part? Most challenging was the traffic. I could never really just peacefully walk because the traffic was constant. Blisters and knee pain were always a constant as well. How did you keep your spirits up when you were having a hard day? You have to keep thinking about why you are doing what you are doing. You also remind yourself that any of your discomforts are temporary while someone with HD can't just say "I'm done in three weeks." I also had people walk with me for various portions of the trip so that helped me get through those days. What were some of the most memorable moments of this experience? Having family members join me was special. The many people that stopped me on the road and wished me well and the many people on Facebook and Twitter that cheered me on were all special moments. The most special moments and messages were when people that had a connection with HD contacted me and endorsed my campaign. I knew then that I was doing something beneficial. Before that, I wasn't sure how much people with HD or had a connection with HD wanted a spotlight shone on the disease. Their messages eased my mind that it was okay and timely to raise the profile of HD. Congratulations Greg! We are so proud of what you were able to do! Greg’s fundraising page is still open at bit.ly/GregSKWalk, so it’s not too late to make a donation. Camrose County is Teeing Off For a Cure! The Camrose Chapter’s 10th Annual Huntington Society Golf Tournament is not your average golf tournament. This event provides such a fun and relaxing environment that it attracts everyone – not just serious golfers. People of all ages come out year after year because it’s such a fun day! What makes it so fun? The focus is not on competing, but on having a good time – there is a hot dog lunch and a steak dinner, prizes, as well as a live auction and a silent auction that take place after the tournament, making it a fun-filled day for everyone who attends. There is also a special prize for “best dressed team” this year, since this will be the tenth year of the event. Last year, the tournament raised $60,000 for HSC and the Camrose Chapter has raised $380,000 in the last nine years through this event, making it incredibly successful. This also makes it a great event idea for other chapters to think about – especially those chapters who have a lot of support from their communities through volunteers and sponsors. “It is the support that we receive from the community that allows our event to succeed. We are thankful for every person who has helped our golf tournament become a success over the years,” says Campbell. This year’s tournament takes place on June 17th, 2017 at Silver Creek Golf Course in New Norway, AB. The entry fee is $100/person and includes 18 holes of golf, a golf cart, hot dog lunch, steak supper and prizes. Registration takes place at 8:00am with a shotgun start at 9:00am. If you are looking for to host a new golf tournament or re-energize your existing tournament, please contact us at events@huntingtonsociety.ca. For more information on the Camrose Chapter visit the website at www.hdcamrose.ca. For more information on the Huntington Society of Canada, visit the website at www.huntingtonsociety.ca. Irish You Were at the St. Patrick's Day 5K! On Sunday, March 12, some past and present National Staff members met with TeamHD registered participants to shamROCK the Achilles St. Patrick's Day 5K run/walk through the heart of downtown Toronto. For months leading up to the race, people registered with various charities to participate in the race. Our team registered through TeamHD to raise money for the Huntington Society of Canada while aiming for our St. Patrick's themed incentives such as a green gear kit, tie-dyed t-shirts and more. After all the fundraising and preparation, we all braved the bitter cold and enjoyed the scenic route. At the end of the race, we devoured a hot bowl of Irish chili and an ice-cold Steam Whistle beverage while listening to some Irish entertainment and celebrating participant awards. It was a great experience seeing everyone decked out in their St. Patrick's themed running gear and enjoying this unique event. Thanks to all who participated, we raised a total of $$2,835 with 16 participants! This race kicked off the variety of events TeamHD is involved with this year in locations across Canada. TeamHD is the Huntington Society of Canada's group of participants who register, fundraise for and complete marathons in various locations across Canada throughout the year. Visit www.hscevents.ca/teamhd to view participating races, register and start fundraising today! Your event is going well, everyone is smiling and having a good time. Everything is as it should be and you're raising lots of money, but at the end of the night, some people are still leaving with money in their pockets that they intended to spend. Often times, people will come to a fundraising event with a certain amount of money they are willing to spend to benefit the cause. If these people do not see anything in the auctions they would like to bid on or still have money left after buying what interests them they need another opportunity to donate that money for the cause. Fund-A-Need is a request for donations that happens at the end of the silent auction or live auction. Keep reading to discover how to incorporate this element into your fundraising event! Start the fund-a-need with a guest talking about their HD experience or show a short video that explains the certain cause you are fundraising for. This should "sell" your cause to the crowd. A good story is key. The emcee should then go through a series of donation levels in descending order such as $500, $350, $250, etc. These can be set to best suit your event. Event attendees raise their hand to support at their chosen level amount and volunteers throughout the room will collect names and amounts. Thank donors, announce the total and continue with your event. A Fund-A-Need is traditionally done at a gala type event, but can be done at golf tournaments, dances, concerts and even walks. Instead of having volunteers collect the donations, you could also have a jar on the table for attendees to put money in or various other ways, but bids often work the best. To set the tone of the Fund-A-Need, it is best to gather a few "ringers" who agree in advance to donate at a higher level to set the tone for the activity. It can always be difficult to plan an event that depends on the weather conditions. For the Winnipeg Chapter, they were excited and ready for the third year of their annual two-day snowmobile ride, HD500, when a warm spell hit the area. The conditions weren't right for snowmobiling on the February 24-25 weekend, but Brett Mitchell and volunteers didn't let that stop them from having fun and still raising thousands over last year and their initial goal. By thinking on their feet and staying calm in light of the significant change of plans, Mitchell and volunteers reassured attendees of the fun activities still going on. The new plan included a fishing derby, bonfire and fireworks with the option to still ride, but using a quad rather than a snowmobile. The group was still able to raise over $16,000 which was $5,000 over last year's total! In order to ensure your event is successful no matter what crisis comes up, always develop a Plan B. Think of the "what ifs" associated with your event... What if the entertainment falls through? What if it rains at your walk or run? By considering these possibilities, you can be prepared for any crisis that may arise and ensure your event is still as successful as it can be. 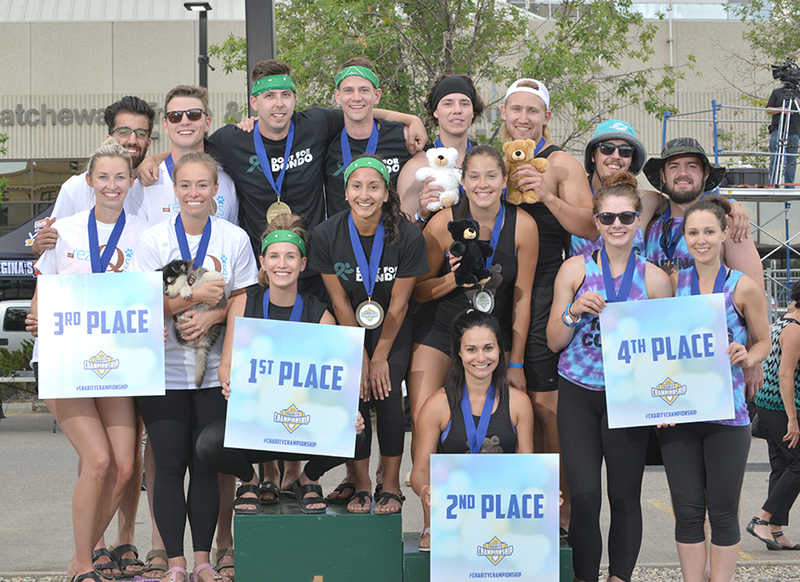 By remaining calm and being flexible in the event schedule, the Winnipeg Chapter has set a fantastic example of what it means to re-actively take control of their event in a time of crisis and still manage to be successful. Love is in the air and there is nothing we love more than helping our volunteers plan and execute successful fundraising events. We understand, though, that it can be hard sometimes to come up with event ideas! So we've compiled a list of some event ideas we have found successful, just to get the ball rolling. Holding a benefit concert in your area is a great way to get a large crowd out to support you. This type of event is mutually beneficial for the cause and the band involved. You get a larger audience of people who like the band but do not know about HD, and the band gets a larger audience of people who want to the support the HD fundraiser but do not know the band. Adding a silent auction or a dinner will also increase your attendance even more. In no time you will be rocking your way to a successful fundraiser. Whether it is celebrating the return of spring, the warm days of summer, the colours of fall or the first winter snowfall, seasonal activities are events that everyone can relate to! Plan a gardening fundraiser in the spring, an outdoor funfair in the summer, a craft show in the fall or a sledding event in the winter. Whichever season you pick, the event should celebrate the weather in some way and you should offer seasonal goodies for attendees to enjoy. Everyone can get on board with celebrating the seasons, and you can raise money for HD in the process. Invite a guest speaker from your community to talk about HD-relevant topics and hold an information session. Individuals who are affected by HD will attend to learn about new research, best care practices and new therapies, while people from outside the HD community will have an opportunity to learn more about what HD is. Offer snacks, a question and answer period and charge an admission fee to raise funds. All of May is HD Awareness Month. Most notably, this is the month that we try to #LightItUp4HD each and every day. The Light It Up campaign's purpose is to have monuments all over the world light up either purple or blue to raise awareness for Huntington disease and Juvenile Huntington disease. Communities also organize flag raisings and other awareness events. You can always plan your own May event and include a fundraising portion such as a BBQ, street fair, walk, etc. to raise funds as well as awareness. Event ideas can range from silly to serious, small to large and easy to difficult, but there are several of them out there. This is only a short list of potential ideas that have proven successful in the past. If you would like to create one of these events or for more event ideas, contact events@huntingtonsociety.ca. HSC aspires to a world free from Huntington Disease (HD). One in every 7,000 Canadians has HD, a devestating, degenerative brain disorder. The symptoms are like having Alzheimer's, Parkinson's and Schizophrenia in one disease. Every child of a parent with HD has a 50% chance of inheriting the disease. There is currently no cure.